A couple of days before Christmas I got a huge box of produce and eggs from Edgerton Farm and when I saw the beautiful sweet potatoes, I knew that I had to serve them at Christmas dinner. Believe it or not, this fabulous side dish has only three ingredients. It is so easy to make and truly delicious. The total cooking time is about an hour and a half so plan accordingly. 1. Thinly slice the sweet potatoes and layer half of them in a baking dish that can go from the oven to the table. 2. Sprinkle half the shredded gouda cheese over the sweet potatoes and about 1 cup of the heavy cream or half and half. 3. Layer the remaining sweet potatoes. 4. Sprinkle remaining gouda cheese over the top and pour the remaining cream gently over everything. 5. Cover with foil and bake for about 30 minutes in a 375 degree oven. 6. Remove the foil and cook for another 45 minutes or so until the top gets a little brown and the potatoes are cooked through. Why gouda? I decided to use gouda cheese because I had half of a wedge of gouda left over from a party on Christmas eve. The gouda tasted absolutely delicious but I looked up a few recipes for a sweet potato gratin with cheese and saw all types of cheese being used – goat cheese, manchego cheese, fontina, cheddar … you name it. I don’t think you can go wrong with a good cheese, good cream, and fresh sweet potatoes. Cream … I would use half and half or heavy cream but I wouldn’t venture into any milk option with less fat than whole milk. If you try something else, please let us know how it turns out! We recently started getting our milk delivered and I can really taste the difference. 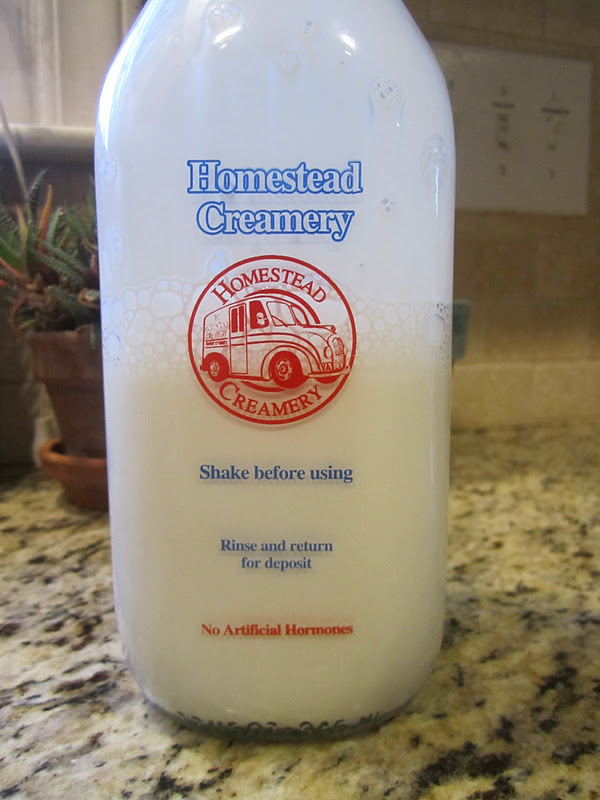 The milk is slow pasteurized instead of ultra-pasteurized like most of your options at the supermarket. Slow-pasteurized milk (heated to 170 degrees) has a shelf life of about 16 days while ultra-pasteurized milk (heated to 280 degrees) can have a shelf life of up to 60 days. Yikes. I’d rather have milk with a shorter shelf-life and way more flavor! If you are in the Charlotte area, definitely check out Lakeview Farms Home Delivery. Mandoline vs. hand slicing … I used to have a mandoline but I recently broke it. It really wasn’t that hard to cut these potatoes thin enough to use in this recipe. The sweet potato slices don’t have to be paper thin – shoot for about 1/8 of an inch to a 1/4 inch thick. Enjoy!! I promise you that everyone will love this recipe! Yum.